The report was commissioned following the request from the Global Environment Facility (GEF) to the Scientific and Technical Advisory Panel (STAP) to explore the relationship between management of unintentionally produced POPs and climate change mitigation strategies in GEF operations. Specifically, the report addresses whether the implementation of best available techniques and best environmental practices (BAT/BEP), in the context of the Stockholm Convention, has synergistic effects on GHG emissions, or whether there are tradeoffs. 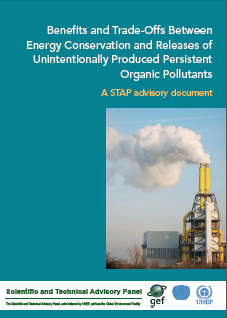 This report from STAP, while showing in many instances that co-benefits do occur also provides recommendations to the GEF, clearly demonstrating the need for careful consideration of Annex C sources that involve significant combustion for heat or energy generation or destruction of waste and gives some guiding principles for analysis of benefits and trade-offs. The report also cautions that some unresolved issues could benefit from further work that considers life cycle analyses. Finally, while this report offers succinct and well targeted advice to the GEF, it also suggests some next steps to take, and it is hoped that with the assistance of the STAP report the continued implementation of the UNFCCC and the Stockholm Convention will take place with increased benefits to both conventions in pursuing the aim of a sustainable future.